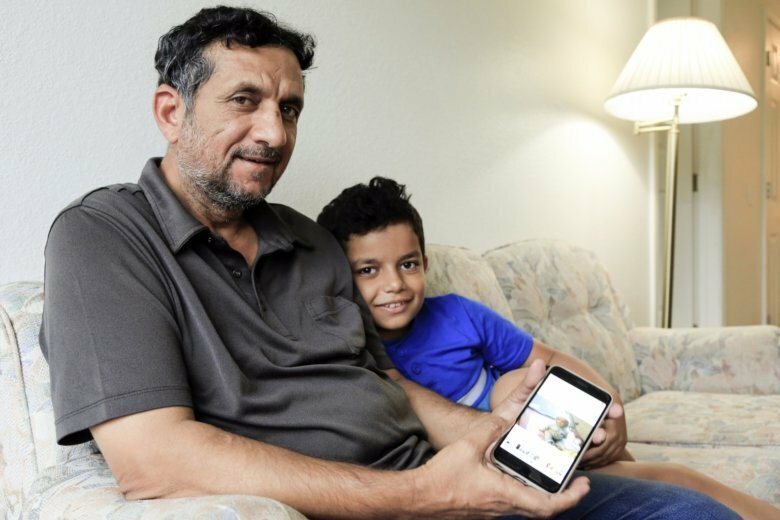 WASHINGTON (AP) — Death threats drove Hadi Mohammed out of Iraq and to a small apartment in Nebraska, where he and his two young sons managed to settle as refugees. But the danger hasn’t been enough to allow his wife to join them. Mohammed, who worked as a security guard for the U.S. military in Baghdad, says he was initially told his wife would be reunited with him and the boys within a month. The wait has now dragged on for more than a year as she goes through stricter screening imposed by the Trump administration. Mohammed says it’s been an agonizing wait, especially for his 9-year-old son. “Every night he cries about mom, I need mom,” he said in halting English as he sat on a couch with the boy in their apartment in Lincoln, Nebraska. Tens of thousands of people are experiencing similar anguished waits as the number of refugees entering the U.S. falls to historic lows because of tighter scrutiny that administration officials say is necessary for security. Critics say it amounts to an abandonment of the country’s historic humanitarian role and discriminates against certain groups, particularly Muslims. The U.S. admitted 22,491 refugees in the budget year that ended Sept. 30. That’s one-quarter of the number allowed to enter two years ago and the lowest since Congress passed a law in 1980 creating the modern resettlement system. It was less than half the maximum that the administration had said it would allow, even with millions of people seeking to escape war and famine around the world. Last month, the cap was set even lower, at 30,000, for the new budget year. Secretary of State Mike Pompeo said at the time the U.S. remained “the most generous nation in the world when it comes to protection-based immigration” but that the government needed to work through a backlog of pending asylum cases and support efforts to resettle people closer to home, so they can eventually return. Behind the reduction are more stringent security protocols for citizens of 11 countries designated by the administration as presenting the greatest potential threat. People from four of them — Iraq, Iran, Syria and Somalia — made up 41 percent of refugees allowed into the U.S. in 2016 and 2017. Now, they make up just 2 percent as people such as Mohammed’s wife, whose name he does not want to publicize out of fear for her safety, face much lengthier background checks. Another Iraqi, who worked as a translator for the U.S. military and now lives in Utah, said he has been waiting for two years to get his mother and brothers to join him. “If my brother is killed … I will spend the rest of my life blaming myself for putting my family in harm’s way,” said the 41-year-old man, who spoke on condition of anonymity because he fears for his family’s safety in Iraq. The State Department acknowledges that the screening and vetting procedures have resulted in fewer refugee admissions in 2018. The tighter screening of refugees reflects one of the signature issues for President Donald Trump, who imposed a travel ban on people from seven majority Muslim countries as one of his first actions upon taking office in January 2017. The Department of Homeland Security has made it harder to enter the U.S. entirely, with more rigorous interviews and background checks. Administration officials say refugee applicants are now subject to strictest, most comprehensive background check process for any group seeking to come to the U.S.
Officials collect more data on refugee applicants and conduct higher-level security vetting. Officers have been given training on how to determine credibility. Fraud detection and national security officers now come oversees with U.S. Citizenship and Immigration Services teams who are processing refugees. Officials say the security changes may lead to temporary slowdowns in admissions but it wouldn’t be permanent and the U.S. continues to help the world’s most vulnerable people. Administration officials say the U.S. remains at the forefront of helping those fleeing persecution, and they note that from the 2008 budget year to 2017, the U.S. gave lawful permanent resident status to 1.7 million people for humanitarian reasons. “We will continue to assist the world’s most vulnerable while never losing sight of our first duty, serving the American people,” Pompeo said last month. In his speech to the United Nations last month, Trump highlighted his administration’s approach as he singled out Jordan, which has taken in at least 650,000 refugees from Syria since the war in their country started in 2011. “The most compassionate policy is to place refugees as close to their homes as possible to ease their eventual return to be part of the rebuilding process,” he said. In choosing who can enter as a refugee, the administration is also showing a preference for people from countries that don’t have a majority Muslim population. Refugees from Ukraine and the Democratic Republic of Congo made up more than 46 percent of refugee admissions in 2018, compared with 22 percent in 2016. The number of Muslim refugees allowed into the U.S. also has dropped. Christians made up 63 percent of all refugee admissions in 2018, compared with 40 percent in 2017. Muslims, who had been 42 percent of all refugee admissions in 2017, were only 14 percent in 2018. There were 140 Iraqis accepted during the just-ended budget year, down from 6,886 the year before. Mohammed’s son says his father is lost without his mother: He can’t cook, he can’t take care of the children very well alone and they need her. Plus, they’re afraid of what will happen if she doesn’t leave Baghdad. Mohammed worries she could be a target because he provided security at U.S. military bases. Associated Press data journalists Meghan Hoyer and Michelle Minkoff contributed to this report.